Hilltop Foods introduced as World renowned launcher of natural and sifted spices for many years successfully. It stocks over hundreds of spices and herbs products with different quantities and hygienic packaging. According to this health hazard, BPA is an industrial chemical that has been used to make certain plastics bottles, which is harmful to human health and responsible for the Internal Damage. We are using BPA Free Bottles with an airtight seal. 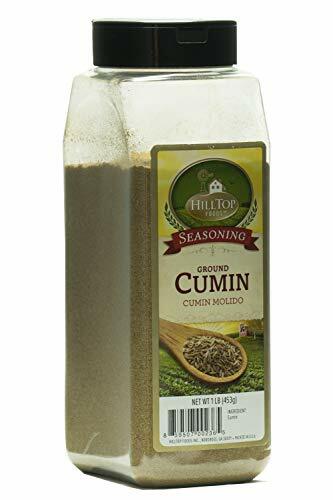 No Artificial Flavor is used in Cumin Seasoning, it gives a Natural Taste with a vibrant aroma, Cumin seeds are organic spice with warm nature and it is a good peppery flavoring enhancer. Cumin has a nutty, peppery, pungent flavor with a rich aroma and oil content. As the taste of cumin is a great complement to the hearty flavor of Legumes such as Lentils, Garbanzo Beans, and black Beans. It is used in everything like Meat, Potatoes, and Vegetables, Enchilada Scurry, Kabobs, Soups and Stews. Cumin seeds are excellent of iron, a very good source of manganese, Calcium, Minerals, Carbohydrates, Proteins, Dietary Fibers and many Vitamins that's Why it is known as Minerals Enriched Nutrition. If you have any questions about this product by HillTop Foods Inc., contact us by completing and submitting the form below. If you are looking for a specif part number, please include it with your message.